Desert Mist Ultrasonic Diffuser functions as a humidifier, atomizer, and aroma diffuser in one simple-to-use product. Inspired by the design of a stylish Moroccan trellis, the Desert Mist Diffuser brings an exotic and modern look to any space. It also helps support a natural environment by replacing harmful household fragrance chemicals with naturally derived essential oils. 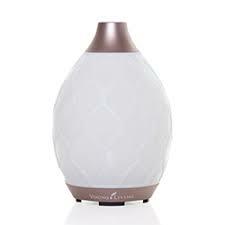 Using ultrasonic frequency technology, the Desert Mist Diffuser generates waves at 1.7 million per second, breaking down essential oils and water into millions of microparticles, dispersing them into the air, and releasing the oils’ unique constituents. This diffuser is custom designed to diffuse continuously for 5–6 hours on High mode, 8 hours on Low mode, and 10 hours on Intermittent mode.